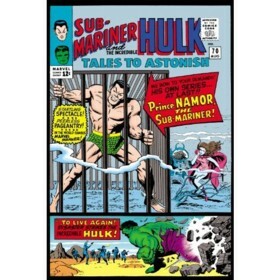 Marvel Masterworks: The Sub-Mariner, Volume 1 is a book in the Comic genre written by Stan Lee and Roy Thomas. The book was published by Marvel on 2011-09-07 and contains 280 pages. The book has an ISBN number of 978-0785150688. Our users found the overall impression of this book to be Exciting. An excellent collection of Sub-Mariner's finest moments. The Sub-Mariner collection collects seventeen issues of Tales to Astonish, one issue of Daredevil, and one issue of Tales of Suspense, for around 300 pages of excellent Silver-Age comic goodness. The comics themselves were written by the legendary Stan Lee and illustrated by Gene Colan. Stan Lee always created some of the most interesting and exciting stories and these are some of his best (especially Prince Namor's quest to claim the Trident of Neptune). And Gene Colan's beautiful illustration of underwater life is breathtaking. Hopefully Marvel will release more Masterworks Editions with other characters such as the Incredible Hulk. This definitely belongs in any Marvel fans collection.